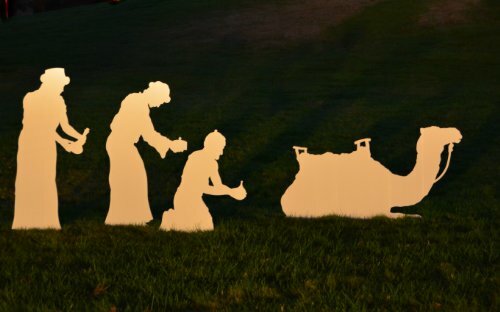 Beautifully designed this wisemen silhouette is made from durable, solid, marine grade PVC (all PVC is not the same). Origionally, I wanted to design my wisemen so it was clear they had just barely arrived at the scene. In an attempt to do that, I planned to have one of the wisemen still standing with the camel. He would be hurriedly pulling his gift from the saddlebag, with his back to the manger but so excited to see the baby that he would be glancing over his shoulder, hoping to catch a glimpse. His emotion, frustration and excitement of finally being there, so close, but still needing to get his gift and settle his camel before he could go see the child...well, it was all very clear to me. So, that is what I drew. I thought it was perfect. I loved it. Then I started showing it to family and friends and without exception, every single person wanted to know what "that guy was stealing". It seemed that without the benefit of the back story in my head, he just looked like some guy ruffling through the pack on the camel and looking over his shoulder to be sure he wasn't caught. The joke quickly became that Jesus had been meant to receive gold, frankincense, myrrh and silver but "that guy" stole the silver. So I decided it was time to let go of my preconceived notions and just draw. And, just as it was with the angel, the design just drew itself. What I realized as I drew was that except for the angel, those wisemen were the only ones there who may have truly understood what was occurring. They knew the signs. They had travelled great distances, probably for years, to be a part of this story. They understood it to be a fulfillment of prophecy; a miracle that would change the world; and I believe, with that understanding came profound humility in the honor of being part of it. I've mentioned here that every time I draw a character for this nativity, the word 'peace' seems central in my mind. But with these wisemen, the word that was constantly there was 'humility'. NOTE REGARDING SHIPPING COSTS: Unfortunately, when you purchase more than one extra character (or an extra character with your nativity) you will be charged to ship each character separately (when I will in fact, get as much into one box as I can). For now, all I can do is refund what you are overcharged. I'm hoping to find a better option but for now, that is the best I can do. If you have any questions about this product by MyNativity, contact us by completing and submitting the form below. If you are looking for a specif part number, please include it with your message.